Xu Xing digs out fossil fragments from the ground deep in a desert in northwestern China’s Xinjiang Uygur Autonomous Region during a field survey in August 2005. Xu and his team discovered important fossils of Limusaurus inextricabilis and Haplocheirus during the field survey. Xu ended up devoted to paleontology by accident. Born in Ili in northwestern China’s Xinjiang Uygur Autonomous Region in 1969, Xu dreamed of becoming a physicist when he was young. At the age of 18, he enrolled in Peking University. With only a few options back then, he was assigned to the department of paleontology. After graduation, he joined the Institute of Vertebrate Paleontology and Paleoanthropology under the Chinese Academy of Sciences (CAS). While in school, Xu attempted to transfer to the economics department and learned computer sciences himself for a while. Not until the third year of his postgraduate program did Xu begin to experience close contact with dinosaur fossils, which sowed seeds of interest in paleontology that gradually bloomed in his heart. Xu likens his relationship with paleontology to a couple who “married first and fell in love later.” “After I really dove into paleontological research, I realized how interesting it is to examine fossils and write papers,” he explains. For more than two decades now, his work has focused on the research of dinosaurs dating back tens of millions of years. Xu prefers working outdoors over spending all day in the office or laboratory. Fortunately, researching dinosaurs requires both lab work and fieldwork—Not only do paleontologists observe fossils under a microscope, analyze data with a computer and write papers in the office, but they also collect fossils in the wild. Since the late 1990s, Xu and his crew have conducted field surveys almost every year, leaving footprints in provinces and autonomous regions including Xinjiang, Liaoning, Jilin, Heilongjiang, Inner Mongolia, Hebei, Shandong, Yunnan and Hunan. The places they visit are usually located in deserted areas. A field survey can last as long as 70 days, and even the shortest takes a few weeks. The size of a survey team ranges from a dozen up to more than 30 members. The area of an excavation site varies from dozens of square meters to tens of square kilometers. During expeditions, Xu and his crew often live in tents for months. Sometimes their camp is set up hundreds of kilometers from the nearest water source, and the crew must transport supplies every week. Xu remembers once trekking through the wilderness for more than 20 days, after which his socks could “stand” on their own due to being soaked in sweat and dirt for so long. 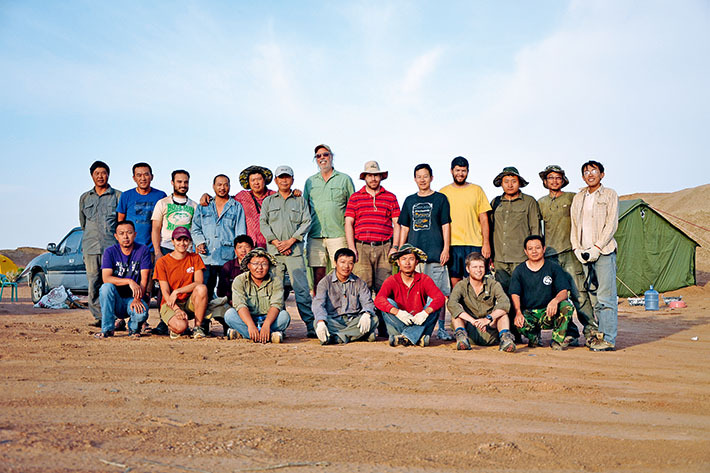 August 2011: Members of a China-U.S. joint survey team pose for a photo at their base camp in a desert in Xinjiang Uygur Autonomous Region. Professor James M. Clark (7th left, back row) from George Washington University has been a research partner of Xu Xing (5th right, back row) for many years. Since 2000, they have conducted scientific expeditions in regions like Xinjiang and Inner Mongolia almost every year. 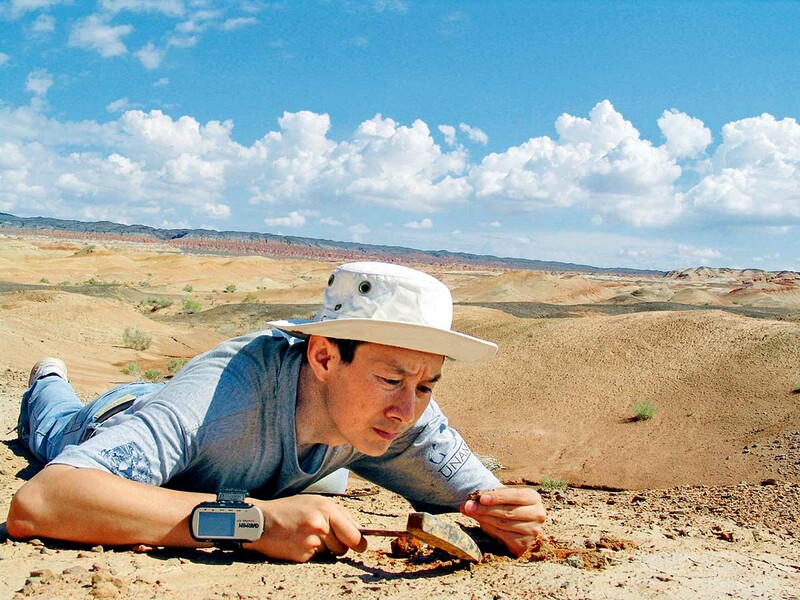 For paleontological researchers like Xu, harsh working environments remain bearable, but the greater challenge is overcoming trips in which they come up empty. Although scientists can choose the sites for fieldwork based on geological conditions, existing research and their experience, the process of excavating fossils in the wild remains full of uncertainty. Xu reveals that at least a third of their field surveys ended up with no discovery of any fossils with research value. But Xu is lucky because his team has often discovered valuable fossils and specimens in places where others previously found nothing. For instance, Xu and his crew discovered fossils of four never-before-seen dinosaur species in Inner Mongolia’s Erenhot, where several foreign survey teams had previously worked. Of the findings, Gigantoraptor was listed as one of the Top 10 Scientific Discoveries of 2007 by Time magazine. When he was young, Xu spent three to four months a year doing fieldwork. The delight of discovering dinosaur fossils came at the cost of devastation to his health. Lengthy work in the wilderness resulted in his knee problem and gastroenterological disorders. Once, while carrying a 50-kilogram pack of plaster, Xu seriously injured his waist—an injury which continues to plague him to this day. Even so, the 50-year-old paleontologist still cannot resist the allure of nature and conducts field surveys every year. Xu believes that the only way to find answers to the questions still haunting him is to personally investigate the places where dinosaurs lived. A fossil of Limusaurus inextricabilis, discovered by Xu Xing and his team in Junggar Basin, Xinjiang Uygur Autonomous Region, in August 2005. Four years later, they named the dinosaur genus Limusaurus inextricabilis in a paper they published in the Britain-based scientific magazine Nature. Excavating and finding fossils is merely the first step of paleontological research. “When you have rice, how do you cook it?” Xu asks hypothetically. “Interpreting information and data depends on a scientist’s skills.” For Xu, scientific research is like playing a game involving finding interesting questions and then solving them. The “game” to which Xu has devoted the most energy is researching the origin of birds. As early as 1868, British naturalist Thomas Henry Huxley concluded that birds evolved from dinosaurs, a theory now widely accepted. However, in 1995 when Xu began his career as a paleontological researcher, the theory remained a hypothesis clouded in doubt. For instance, the archaeopteryx is believed to have lived in the late Jurassic Period 150 million years ago, but fossils of bird-like dinosaurs can only be dated to the Cretaceous Period that started 145 million years ago. Many believed that the hands of bird-like dinosaurs had three fingers, with the outer two fingers were lost during the course of evolution. Modern theory on avian embryo development suggests that birds have three digits (like fingers) in their wings, with the innermost “thumb” and the outermost “little finger” lost during the process of evolution. “The best way to dispel doubt is to find more evidence and make more analyses,” Xu grins. After years of field surveys, his team discovered not only many fossils of Jurassic bird-like dinosaurs that lived earlier than the archaeopteryx, but also some fossils of Limusaurus inextricabilis, an herbivorous theropod dinosaur. Research of the fossils of this theropod indicated that bird-like dinosaurs didn’t lose their two outer fingers but the thumb and little finger. The three fingers in the middle remained—just like today’s birds. In past decades, Xu has been endeavoring to shed more light on the relationship between birds and dinosaurs. With more and more valuable fossils discovered around China, a basic theoretical framework that birds evolved from dinosaurs has been gradually established. 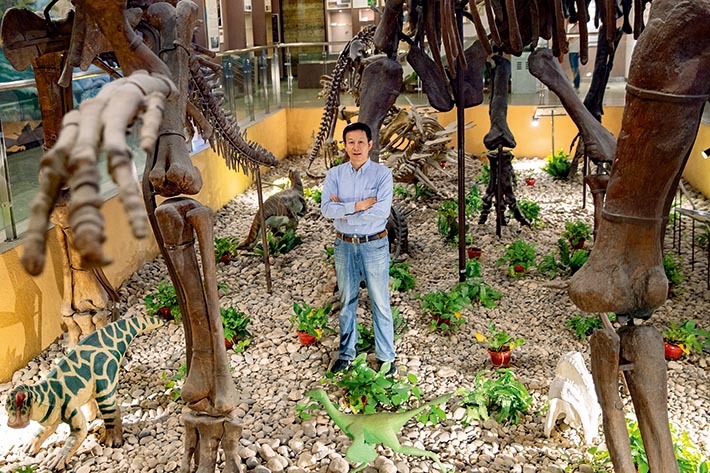 Xu Xing stands amidst replicas of dinosaur fossils at the Paleozoological Museum of China. 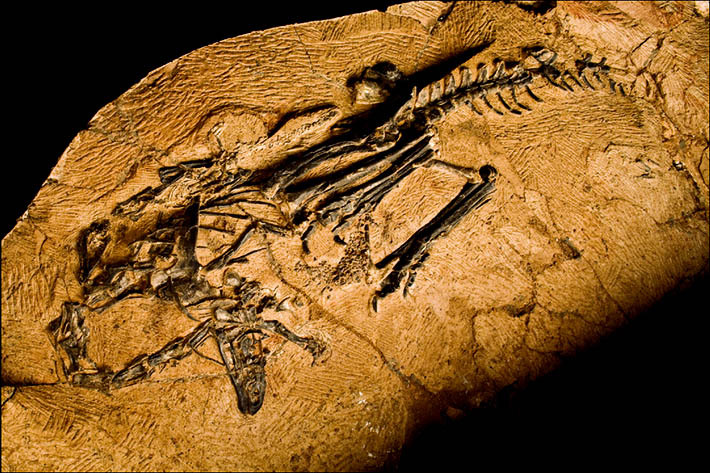 In 2000, Xu and other researchers including CAS Academician Zhou Zhonghe discovered some fossils of Microraptor in western Liaoning. The feet, toes and claws of Microraptor were similar to those of some tree-perching birds. Through years of research, Xu concluded that Microraptor had an asymmetric plumage structure, just like birds with strong flying ability. Moreover, the dinosaur had not only its forelimbs and tail covered with feathers, but also hind limbs. That means it has four wings. Fossils unearthed in Liaoning, Hebei and Inner Mongolia in the subsequent decade showed that many other dinosaurs and even some of the earliest birds featured four wings. In the mid-1990s, Xu installed a dial-up modem to the computer in his office at his own expense so he could email foreign colleagues to ask for references, consult on scientific concepts and methods and ask for feedback on his papers. James M. Clark, a professor of paleontology at George Washington University, was one of the earliest foreign scholars to write back to Xu. Xu’s paper documenting this finding was published in Journal of Vertebrate Paleontology and Nature as a major breakthrough of his early-stage research. Later, Xu and Clark became close partners. Since 2000, they have conducted scientific expeditions in regions like Xinjiang and Inner Mongolia almost every year. 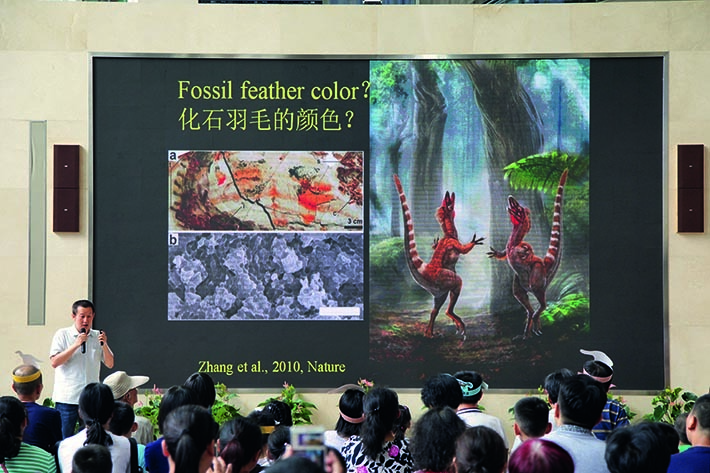 July 2017: Xu Xing lectures on dinosaurs at Zhejiang Museum of Natural History in Hangzhou, capital of Zhejiang Province. In Xu’s opinion, knowledge should not be confined to academic circles, but spread throughout the public. He took an active role in the establishment of natural history museums such as the Erlian Basin Cretaceous Dinosaur National Geopark in Inner Mongolia, the Zhucheng Cretaceous Dinosaur National Geopark in Shandong and the Changji Dinosaur Museum in Xinjiang. Moreover, he has participated in popular science programs on television and radio and authored mainstream articles and essays on popular science. His Dinosaurs Flying to the Blue Sky has become standard curriculum for Chinese primary-school students. Xu is particularly fond of disseminating knowledge about dinosaurs to children, in hopes of inspiring them to explore the secrets of nature. Visitors to his office at the Institute of Vertebrate Paleontology and Paleoanthropology will witness several handwritten letters taped to his filing cabinet with greetings and questions from children.